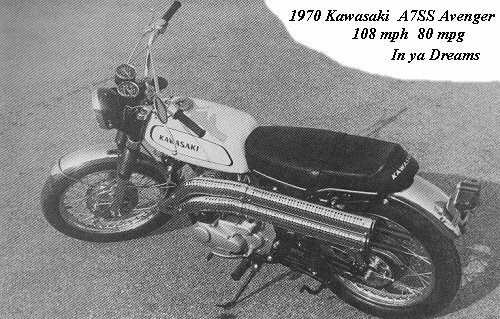 This profile is based on my own 1970 A7 Kawasaki, low pipe model. The A7 and the A7ss are virtually identical with the exception of the muffler system and handlebars. The A7ss images are used simply because I have them at my disposal. Also keep in mind that my bike is now 29 years old and as yet unrestored. Considering the modest 338cc capacity of the Kawasaki A7, riding one is a real eye opener. 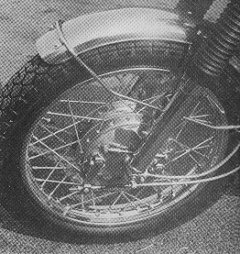 No other 'off the rack' 350cc motorcycle of the early '70's could compare. Even the Kawasaki 500 triples could be humbled on winding roads. Hi-side pipes of an SS. Better conering and perhaps a little warmer in the winter. The twin rotary valves seem to handle traffic well. Less gear changes are needed than other non rotary 2 strokes I own. When cold the clutch operates perfectly but once the clutch heats up a little there is a noticeble drag and sometimes the gears will not disengage correctly. At this time the clutch on my A7 slips under load but this I will correct when I begin the restoration process in a few months. In most cases replacing the clutch springs will eliminate clutch slippage. The tank styling in this photo is the same as mine. I actually prefer the earlier tanks with the knee pads and tank badges however I won't be tempted to make the change as I want to keep mine as original as possible. Anyone know of a source for the tank and side cover transfers. As far as I can tell the instrument readings are pretty accurate. 0 bounce in the needles unlike my T20 which seems to jitter around constantly. Instrument lighting is bright and very easy to read at night. This photo shows the CDI setup. My bike has the conventional points system yet it is the same year of manufacture as this SS. I can only presume that this is as it came from the factory. I can't possibly see any reason why one would convert the easier to start CDI setup for a points system. Not that I have trouble with mine.From a cold start you need to utilize the choke and usually about 3 kicks and your "smoken"
p>If you need work done on your classic machine, from basic service to full rebuilds, contact me, I can help.